WITH THIS COMPREHENSIVE DVD STUDY PROGRAM! Thinking about grad school? Then you’d better start thinking about the GRE — especially because it just got a lot harder! The Graduate Record Exam General Test (which underwent sweeping changes in summer 2011) is the most commonly required admissions test for postgraduate degree programs at American universities. Taken by more than 600,000 prospective graduate school applicants from approximately 230 countries each year, this challenging exam can be a pivotal event in your academic career. In fact, your score on this all-important test can make or break your chances of getting into the university of your dreams and earning that coveted master’s degree or doctorate. 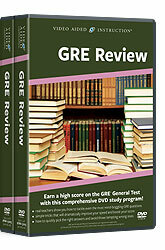 Luckily, Video Aided Instruction has NEW DVDs for the NEW GRE! Our brand new, comprehensive study program can give your GRE score a significant boost! 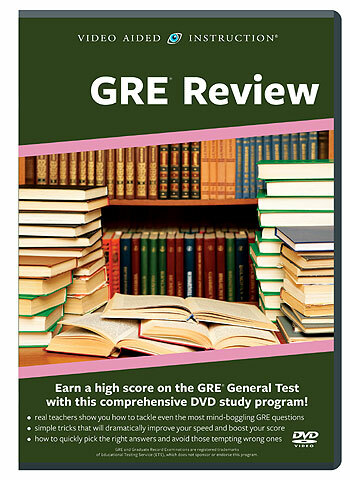 In this jam-packed DVD set, you’ll get extensive practice with a wide variety of GRE-style writing, reading, and math questions and hands-on training with the new, unique, and tougher question types on the revised exam. Along the way, our expert instructors provide easy-to-follow explanations — and insider secrets for conquering the new GRE. Now it’s easier than ever to take the stress out of studying, make the most of your time, and maximize your GRE score — with Video Aided Instruction!